The Sports Ministry is seeking legal advice to sack Sri Lankan cricket Head Coach Chandika Hathurusingha over his team’s poor performance in the last 13 months. Hathurusingha was hired for an annual salary of Rs 90 million in January 2018 on a three-year contract in the hope he could change the flagging fortunes of the country’s best loved sport. But after a calamitous year, the Sports Ministry is consulting lawyers. Accordingly, his contract has been sent to the Attorney General’s Department to explore the possibilities of terminating it prematurely. The Sports Ministry has also instructed Sri Lanka Cricket (SLC) to submit a report on Hathurusingha's performance to assess his contributions during the short stint. “On the instructions of the Minister of Sports, we have sought legal advice from the AG’s department to see the possibility of ending his services early,” a senior Sports Ministry official told the Sunday Times. 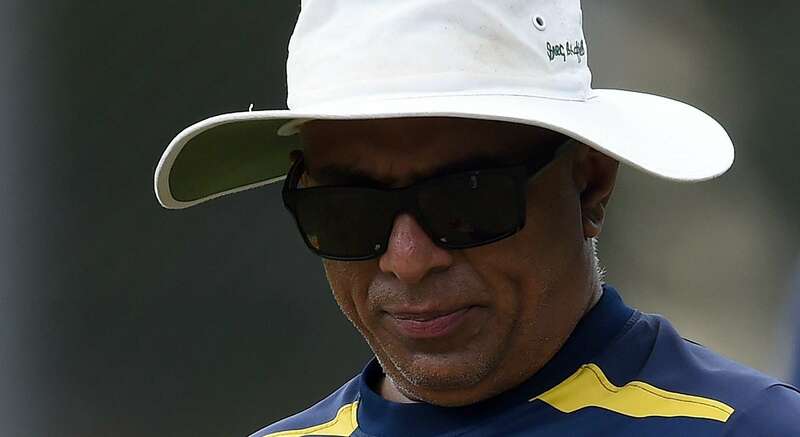 If Hathurusingha is given the marching orders ahead of the South African series which begins later this month, Sri Lanka A Coach Avishka Gunawardena or the national team’s Fielding Coach Steve Rixon is likely to succeed on interim basis till Sri Lanka finds the right replacement. SLC's appointment of Hathurusingha as Head Coach for a record salary was justified owing to his previous record in Bangladesh ,where the perennial minnows reached unprecedented heights during his first stint with a Test team. His job scope includes, but is not limited to, conducting training sessions, planning and strategising, preparing players both mentally and physically for tours and building team spirit. Since he took over, Sri Lanka has played 42 international matches--including 13 Tests, 20 ODIs and nine T20 Internationals--but have lost 24 of them while winning 14 across formats. The team also won a series in Bangladesh, recorded the country’s first Test win in the West Indies and beat South Africa 2-0 in a Test series. But performance has not been consistent across all formats. England beat Sri Lanka soundly at home 3-0 and the team also suffered a 1-0 defeat at the hands of New Zealand in Tests towards the latter part of 2018. They now trail 1-0 in the two-match Test series against Australia. However, the biggest concern has been team’s limited-over performances over 13 months. In ODIs, Sri Lanka won a tri-series in Bangladesh, It was the only series win under his stewardship. But they crashed out of the Nidahas Trophy final in Colombo, fell to South Africa, England and New Zealand and had a shock first round exit at the Asia Cup after losing their opening encounters to Bangladesh and Afghanistan. Hathurusingha, who was instrumental in bringing Angelo Mathews back as captain in January last year (six months after the all-rounder retired), played a key role in sacking him following the Asia Cup debacle. Hathurusingha played 26 Tests and 35 ODIs for Sri Lanka before becoming Shadow Coach under Trevor Bayliss. He was then appointed Coach for Australia’s New South Wales side, landing the more lucrative Bangladesh job in May 2014. Sooner the better. Hathuru has been a disaster, he should resign and move on. I don't firing CH would be a good decision at this juncture. Let hime finish up what he has started. Don't think hiring a new coach would fix the problems. Priority should be to clean-up the administration from corruption. Good move ! Its time for a high calibar foreign coach. As long as SL has been managed by a Sri Lankan coach we have never performed. To search for a new coach when the World cup is near the corner to say the least is a stupid thing to do. Are you also going to import players to our team may be like Joffra Archer for England??? Please discipline our cricketers and their wives and field the best team and hope for the best! Play the best team available.How come over the years the SL “A” team always do well,but not when the same players move into this national team? Coach is not the problem. There is enough tallent to get good results. Players need to put love for country first before self interest and money. Cricket administration needs to seriously investigate match fixing in Sri Lanka. This is the biggest problem in sports. It can be too tempting for talented players to throw matches to make a quick buck on the side !! Under Hathurusingha's watch, SL lost twice to Bangladesh. Shame. Send him packing.